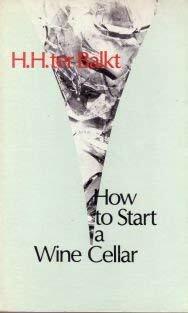 How to Start a Wine Cellar by Balkt, H. H. Ter: Riverrun Pr 9789070306113 PAPERBACK - Isaiah Thomas Books & Prints, Inc. Member: Antiquarian Booksellers Association of America, International League of Antiquarian Booksellers, Southern New England Antiquarian Booksellers. "One of the finest in N.E. (&) the premier used book shop on Cape Cod." - Used Book Lover's Guide. We are a general used and rare book shop with about 70,000 volumes. Located half way between Falmouth and Hyannis (4632 Falmouth Rd, Rte 28), we are named in honor of the famous colonial era printer and philanthropist, founder (1812) of the American Antiquarian Society in Worcester. We started in Worcester in 1969, and moved to the Cape in 1990. Impressed with architectural craftmanship, in Worcester we were stewards and renewers of a decorative Queen Anne Victorian. Here on the Cape we take care of the newest (1860) Crocker family home in the village of Cotuit, part of the town of Barnstable: a tall peaked Italianate Victorian now painted pink and four other colors. The owner's training has included work in four libraries and apprenticeship with bookseller Irving Ephraim (1908-1989) of Worcester who began his own career during the depression. Able assistants have always been and known the meaning of 'book people.' Remembering with fondness Mr. E. and the enormous influence of our home town librarians, we try to continue their tradition of service. Inquiries and orders gratefully received. 508-428-2752. isthomas@aol.com. www.isaiahthomasbooks.com.Please visit us in our open shop on Cape Cod. Open Tuesday - Saturday 10-5, Sunday 12-5. Open Monday in the summer. Bookseller: Isaiah Thomas Books & Prints, Inc.